Is there any evidence that the financial markets weathering rough storms right now will crash in an economic collapse, bringing about a one-world order? Dr. Hitchcock: I think that the financial stresses we have seen in our country and around the whole world during the last year or so is really bringing together this whole idea that there is going to ultimately be a world economy. There is an old saying that goes, "When the United States sneezes the whole world catches a cold." 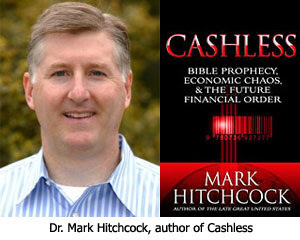 We saw beginning in the Fall of 2008 this financial reverberation throughout the whole world. We have already witnessed in a sense a one-world economy as every nation had to bolster one another. But, when there is a great economic disaster we see it even more. The very first thing the G20 leaders did was to come together and call for a global new deal. Henry Kissinger was calling for a global new world order. Even Rahm Emanuel, Chief of Staff for President Obama, said "You never want to allow a good crisis to go to waste." And so, world leaders who are shrewd use those types of opportunities to really expand their own power. After all, that is what brought Hitler to power in Weimar Germany. It was economic problems that paved the way and set up the platform for him to come to power. "When the Lamb opened the third seal, I heard the third living creature say, 'Come!' I looked, and there before me was a black horse! Its rider was holding a pair of scales in his hand. Then I heard what sounded like a voice among the four living creatures, saying, 'A quart of wheat for a day's wages, and three quarts of barley for a day's wages, and do not damage the oil and the wine!'" What I think we've seen in the last year or so in our world is kind of a precursor to what is ultimately going to happen. That rider on the black horse who runs through the Tribulation represents a time of runaway hyperinflation. It will take everything a man can make just to buy enough food for one day. That is also the same thing that happened back in Germany that paved the way to economic control, because when people have that kind of economic devastation around them they are willing to do anything. They'll turn power over to anybody who can just give them some kind of relief. Dr. Reagan: That's so true. When you see how the United States is operating right now, where our government is basically just printing money like mad, what that's going to ultimately do is generate hyperinflation. The dollar is going to become increasingly worthless. In fact, the dollar is very rapidly becoming increasingly worthless when you consider the fact that the only thing that has really kept the dollar alive has been that oil is tied to it — the Petro Dollar. Now nations are moving away from that. Even nations like China are saying the world has got to move to a world-wide currency. Tremendous pressure exists right now to get rid of the dollar and go to a one-world currency. Dr. Hitchcock: A number of countries want to get rid of the dollar, which is kind of the super world reserved currency, and ultimately move to a one-world currency. Not long ago, Russian President Medvedev had a coin that was an example of a possible new one-world currency. It was just a facsimile or a precursor to what could be the real deal, but he had this coin which he keeps in his pocket. And so, there is this move afoot towards a one-world currency. But, I think there is going to have to be real economic devastation to have this ultimately take place. I think the world will come together economically before it will come together politically, and then the Antichrist will just use that crisis to take power. Nathan Jones: Like the EU did right? The EU came together economically before they were a political union. The European Union is a model of what is to come. Dr. Hitchcock: That's right. The economic union brought about political union, which it always does. Even there it was unthinkable that the Germans would give up the Deutsche Mark or that the Italians would give up the Lira or the French would give up their money, but they did. There are about 192 countries in the world, so people say, "How are you ever going to have one currency or one economy among all of them?" Well, we've got 27 nations now in the EU and almost all of them have adopted the Euro, and they all will eventually have to for cohesion. There is a large percentage of the countries in the world that already have adopted a single currency, so we can see how this shift could easily take place.